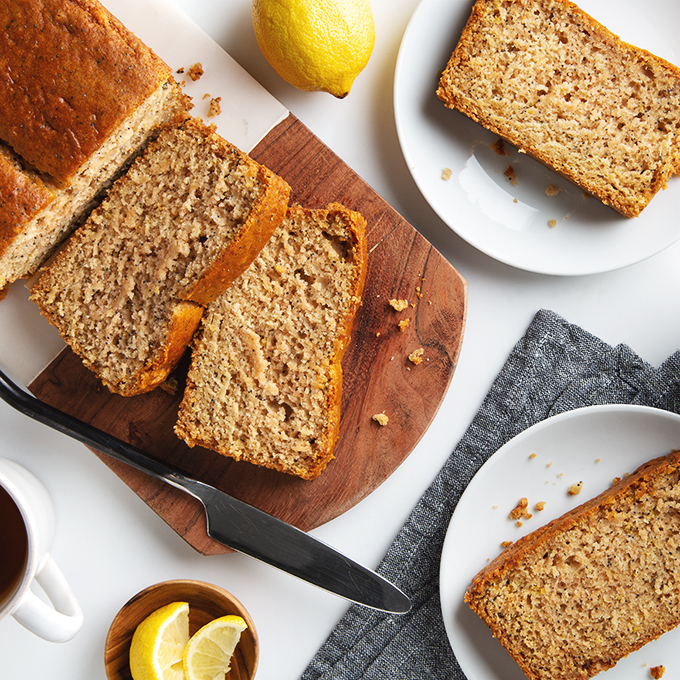 We’ve definitely entered the season of all things baked goods—pies, cookies, cakes, and if you’re a member of the Scott family: lemon poppy seed bread. Aaron’s mom makes it for holidays throughout the year and I always indulge in a slice (or two) because I can never turn down a lemon dessert. This year the baking bug hit me hard and I decided it was high time I came up with my own recipe for vegan lemon poppy seed bread. 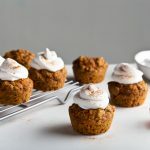 My version is lightly and naturally sweetened with coconut sugar, but make no mistake—the texture is more cake than bread. That aside, I’m still me and I couldn’t resist healthify-ing it just a little. I used a combination of plain non-dairy yogurt (my homemade cashew yogurt works really well here) and unsweetened applesauce in combination with a small amount of extra virgin olive oil to keep it lower in fat. The applesauce also doubles as an egg replacer, so wins all around! P.S. You might also enjoy my Vegan Lemon Meringue Pie! This vegan Lemon Poppy Seed Bread is simple to make and always a crowd-pleaser! 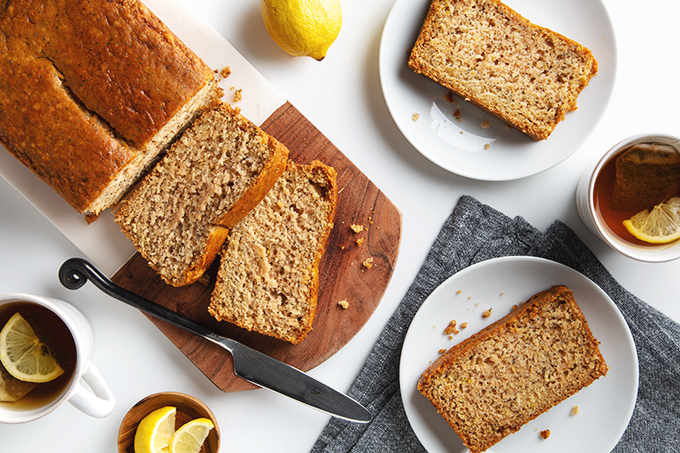 It has a light, tender crumb and a bright lemon flavor. Pre-heat the oven to 350° F. Lightly grease a 9 x 5 inch loaf pan. In a large mixing bowl, whisk together the yogurt, coconut sugar, applesauce, plant milk, olive oil, lemon zest, and lemon oil. Sift in the flour, baking powder, baking soda, and salt. Mix until just combined, then fold in the poppy seeds. Transfer the batter into the prepared loaf pan and spread the top into an even layer. Bake for 50-55 minutes, or until a toothpick inserted in the center comes out clean. Let sit in the pan on a cooling rack. 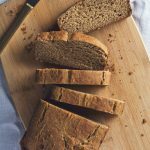 Once cool, invert the bread onto a cutting board or serving plate. (If it doesn't come right out, you can use a small rubber spatula or knife to gently go around the edges of the pan to loosen any stuck sides.) 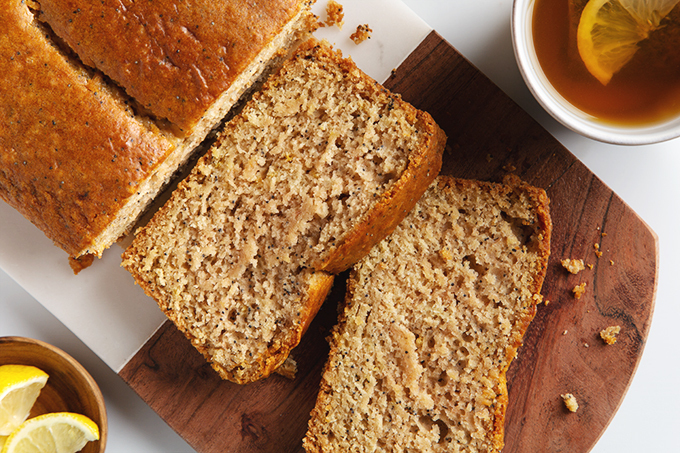 Leftover lemon poppy seed bread will keep loosely covered for up to 3 days at room temperature. Filed Under: Breads COPYRIGHT © 2019 Amanda Maguire. All Rights Reserved. « Have a Delicious December. Thank you! I love how the texture turned out here. 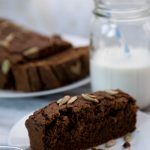 this does look delicious but since you brought up the whole bread vs cake questions and i’m really more of a bread person, I’m wondering what it take to make this more bread like. Do you have any suggestions? thanks. I would probably try replacing the all-purpose flour with something a bit denser…maybe whole wheat pastry or spelt flour to give it a heartier texture.